Stop non-value-added activity to make room for value. 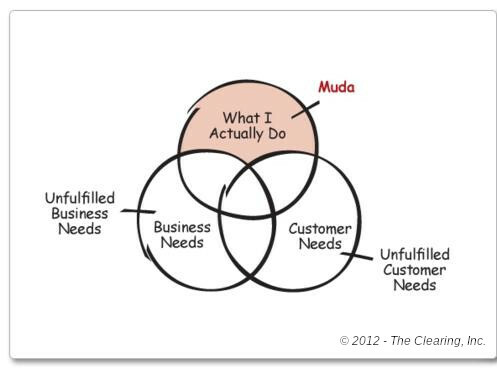 “MUDA”: resources allocated to things that do not address the needs of the mission or the team. The MUDA PRIME helps ensure that all available resources are focused on the most important aspects of business and customer needs. The status quo is loaded with people spending time and money on non-value-added activities. The Japanese call this “MUDA”: resources allocated to things that do not address the needs of the mission or the team. MUDA is like “corporate cholesterol.” It builds up slowly, silently, and continuously until it chokes the system. Like a selfish child, the As Is (CORE PRIME) threatens to require all available resources, and then some. At the same time, pressure grows to conserve resources. Developments occurring in our Environment (CORE PRIME) make our own CHANGE or TRANSFORMATION imperative, but these efforts require even more resources. The conditions above create a “perfect storm” faced by businesses and organizations every day. It may become a matter of survival to free up scarce resources quickly, to invest in problem solving, change or transformation, while protecting a mission and a team from added risk. We must first recognize that the status quo wants us to think that no resources are available for doing anything other than keeping things like they are. That kind of thinking serves only to maintain the As Is. Once you recognize that the status quo is lying to you, MUDA isn’t that hard to eliminate. First, list all of the business needs and requirements. Second, list all of the customer needs. Next, list all of the things you actually do. Then, look at the overlap between the lists. STOP spending time and money on non-value-added activities. If you don’t take the critical steps to eliminate MUDA, you will never have the resources and focus to create the future. Special thanks to Kai Dozier of CEI-Star, for his invaluable insights in developing this PRIME. Copyright © 2019 ThePrimes.com. All Rights Reserved.